Last week, my friend Sashee asked me if I wanted to bake with her. I haven’t baked anything (well, except for Funfetti cake and I don’t know if that counts) for years now, but I do love baked goods almost as much as I love breathing air, so of course I said yes. We made these Black-Bottom Cupcakes which turned out really well, were delicious and easy to make. I finally got to put my heart-shaped muffin tin to use. Aren’t the hearts cute? I nabbed the tin at Denise’s house when I noticed it in her box of items to give away to Goodwill. Of all the places to find some love! Is this vanilla cake in the center? It looks like melted cheese on the picture!! 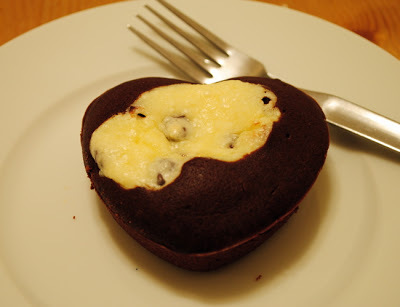 Do you know where I could possibly find a heart-shaped muffin tin like that? It's too cute! Holy cupcakes but I really wish I had one on my desk right now! These are sooo cute. I have never seen a muffin tin like that. Is that cream cheese in the center? Yep, they have a totally awesome cream cheese center. MMM. I asked Denise where she got the tin and she doesn't remember, but thinks either Target or Marshall's. If I ever see one, I'll let you know! Those look really good! Did you miss Valentine's day though? 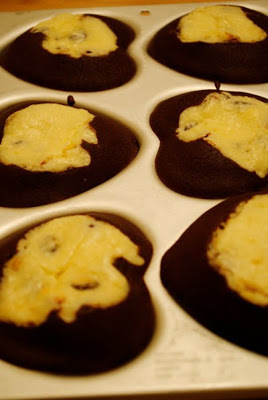 But of course every day is a great day to make heart shaped goodies! I actually was able to find that exact same one on amazon for a bit cheaper. Just sent in my order and now I can't wait to use it! Oh my goodness. I love black-bottom cupcakes! I'll have to (try to) make them sometime soon!!! They look lovely in a heart shape too.